← Dimitrov and Roddick Get Through Shaky Day at Winston-Salem Open. Andy Roddick Serves Under the Lights in Winston-Salem. When Andy Roddick showed up last night to play his first match at the Winston-Salem Open, it was a given that not only would the night be a sell out but that Roddick would likely roll over his opponent Edouard Roger-Vasselin. Roddick, who hadn’t won a match since Wimbledon, desperately needed not only a win, but a convincing win if nothing else to boost his confidence before heading up to New York next week. The match itself had its moments, but what I found more compelling to watch was the actual audience on hand who were very, very excited to see Roddick live. Roddick may have been grateful to get the wildcard into the draw, but you better believe the tournament organizers were even more thankful that Roddick showed up last night to boost their inaugural event. Mardy Fish may be the new U.S. No.1 and deservedly so, but he still lacks Roddick’s star power as one of the few universally known players in the country, regardless if you follow tennis or not. 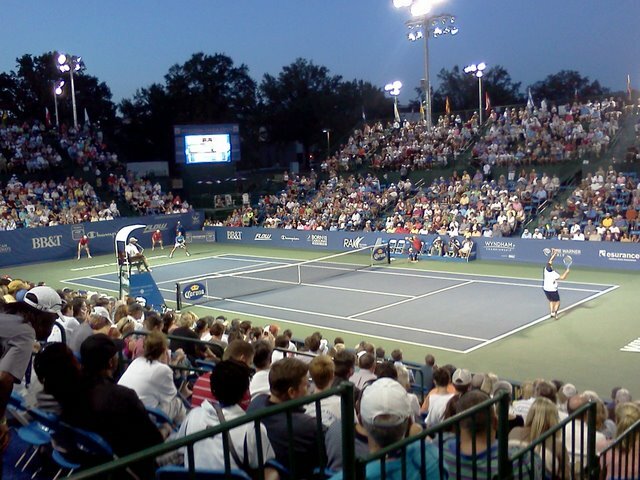 Spectators Catching A Glimpse of Roddick Playing Live at Winston-Salem. The buzz was palpable even as fans sauntered in to take their seats. When Roddick finally took the court to a thunderous roar, even those still milling around after grabbing something to drink all wanted to see for themselves that it really was THE Andy Roddick before them. 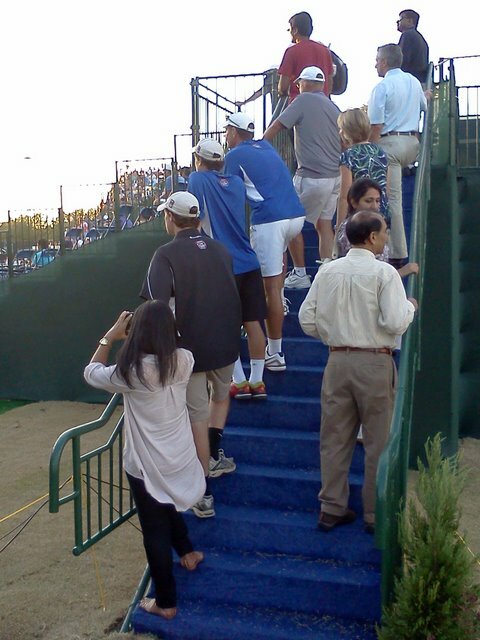 Not only did late arriving fans find themselves climbing up stairwells near the bleachers to get a glimpse of the former U.S. Open champion, but ball kids, volunteers and even a lemonade vendor who decided to get a quick peek of the action when thirsty customers were nowhere in sight. During a changeover, when the excited PA gushed, “Isn’t this something, folks!” fans applauded in agreement. He didn’t mention Roddick’s name, but we all got the hint that it was a special night and we were lucky to be there. A first round Andy Roddick match isn’t usually something memorable, but this one was for me. It’s easy to get jaded after having watched matches live in New York, Indian Wells, L.A and other cities with bigger names and bigger stakes involved. But it was something to watch not just tennis fans but a whole community really come out to watch, perhaps for many the first time live, a tennis match with someone that they knew maybe only from television, newspapers, or wherever. Roddick’s game may not be quite what it used to be and it’s hard to say how his career will be evaluated once he calls it a day, but I hope that moments like last night’s match in Winston-Salem get remembered just as much the day he held up the U.S. Open trophy. Comments Off on A Memorable Night.